Source: Science of The Total Environment, 598:239-248. | November 15th, 2017 | Junxia L, Hailing Z, Kun Q, Xianjun X, Xiaobin X, Yijun Y, Yanxin W.
Natural high iodine and fluoride concentrations were observed at North China Plain. Groundwater fluoride was gradually increasing along groundwater flowpaths. Under reducing condition of Bay area, groundwater had high iodine concentration. Groundwater pH condition is the main factor controlling fluoride mobilization. 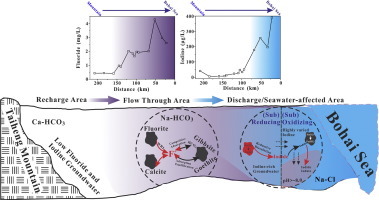 Variation of redox potential and pH co-controls iodine mobilization in groundwater. To better understand the enrichment of fluoride and iodine in groundwater at North China Plain (NCP), speciation analysis and geochemical modeling were conducted to identify the key hydrochemical processes controlling their mobilization in groundwater system. Groundwater fluoride and iodine concentrations ranged from 0.18 to 5.59 mg/L and from 1.51 to 1106 ?g/L, respectively, and approximately 63% and 32.3% of groundwater fluoride and iodine were higher than the guidelines for drinking water (1.5 mg/L and 150 ?g/L). High fluoride concentration (> 1.5 mg/L) can be detected in groundwater from the flow-through and discharge areas of NCP, and high iodine groundwater (> 150 ?g/L) is mainly scattered in the coastal area. Na-HCO3/Cl type water resulted from water-rock interaction and seawater intrusion favors fluoride and iodine enrichment in groundwater. Speciation analysis results indicate that (1) fluoride complexes in groundwater are dominated by free fluoride, the negative charge of which favors fluoride enrichment in groundwater under basic conditions, and (2) iodide, iodate and organic iodine co-occur in groundwater at NCP with iodide as the dominant species. The geochemical modeling results indicate that groundwater fluoride is mainly associated with the saturation states of fluorite and calcite, as well as the adsorption equilibrium onto goethite and gibbsite, including the competitive adsorption between fluoride and carbonate. Groundwater iodine is mainly controlled by redox potential and pH condition of groundwater system. Reducing condition favors the mobilization and enrichment of groundwater iodide, which has the highest mobility among iodine species. Under reducing condition, reductive dissolution of iron (oxy)hydroxides is a potential geochemical process responsible for iodine release from sediment into groundwater. Under (sub)oxidizing condition, as groundwater pH over the ‘point of zero charge’ of iron (oxy)hydroxides, the lowering adsorption capacity of groundwater iodide/iodate on minerals leads to the release of sediment iodine into groundwater.